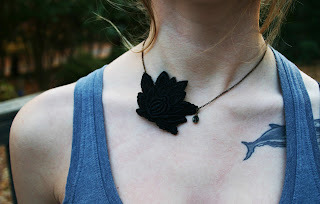 I love the Three Swirl Black Lace necklace! ALL of that jewelry is really, really lovely - but I love that Gold Fall Flower NEcklace with the plum stone - beautiful! I love the boldness of those large pieces. Love the mini umbrella necklace, cuz I live in a really rainy place. following your blog now via google friend connect! 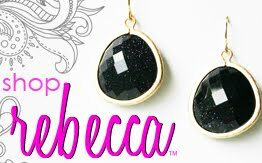 I heard about this giveaway via etsy giveaways on blogspot! My favorite Rebeccca item is the Made to Order Zipper Tote! I follow your blog with google friend connect - I'm your 5th follower! I love the necklaces--especially the new lace ones and any with the bird design. I like the made to order zipper tote--gorgeous!!! Found you on Etsy Giveaway blog! I most like the Ribbon Necklace with faceted stones. I really like the zipper bag and fall flower bracelet! Thanks! I absolutely love the red wine traveler tote!! i found this giveaway at etsygiveaways blog! 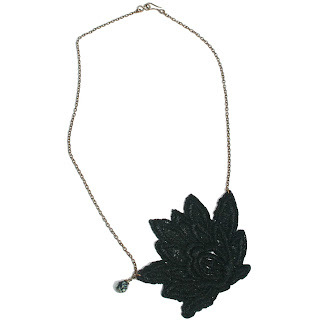 I love the Black Vintage Lace Swirl Necklace!